Yesterday, as I was teaching my very beginning German students the English words for the colours of the rainbow, I was reminded of that multi-coloured cereal that was made so popular in the U.S. in the 80’s by the Flintstones cartoon. When I was a young child living in Ireland, we had an abundance of rainbows but no Fruity Pebbles were to be had in the shops. This was a good thing, because, despite their claim in huge letters that they are gluten free, they have little nutritional value. My dad made us eat heart-healthy porridge, which I hated. When I was about 10, my brother and I were visiting my grandparents in Massachusetts and we were in a large supermarket stocking up on supplies for a sailing trip with them. I was standing in the canyon of a cereal aisle gazing up at the multitude of colourful cereals. My grandfather had given me the joyous task of choosing a cereal for our trip. ‘I want that one’ I said, pointing up to the box of Fruity Pebbles. ‘Are you sure?’ my grandfather asked, knowing very well that I was choosing about the unhealthiest item in the store. ‘Oh, yes!’ I said with big eyes. He must have seen the joy and delight in my eyes and not had the heart to contradict me. ‘Why did you pick out this disgusting cereal?’ my brother demanded of me the next morning as we were breakfasting on the bow of the boat. The Fruity Pebbles tasted awful. My brother and I spent a lot of time holding up bits of bread and other tasty morsels for the seagulls to eat right out of our hands as they flew by. We tried feeding the Fruity Pebbles to the seagulls, but they turned up their beaks in contempt. There are some things, that once you have committed them in your childhood, your family never, ever let you forget about them. This story is one of mine. (I have way worse stories, but I won’t divulge them here). My grandfather has brought this story up dozens of times over the years and for some reason it has become a family joke. Last summer we had a family reunion in Massachusetts and my grandfather came back from the store and presented me with a big box of Fruity Pebbles. I laughed heartily and so did everyone else. They were put in the living room on display for everyone to admire. A few months later, my aunt took the accompanying photo and tagged me and my brother in it and posted in on Facebook. I asked her if she was going to finally eat them or let them fossilize. ‘They are for the family time capsule’ she said. 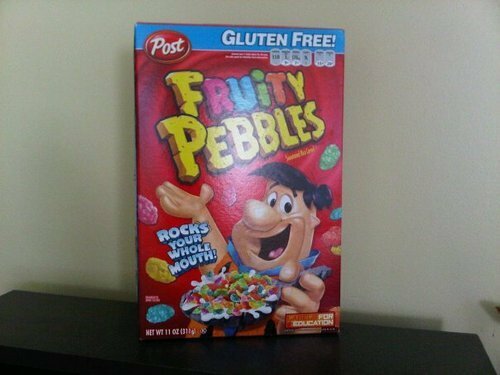 ‘They have enough preservatives in them to last that long!’ Well, I have no idea how long my blog will endure in cyberspace, but as long as it does, the Fruity Pebbles story can have its nook there too.